감지은니묘법연화경 권7(紺紙銀泥妙法蓮華經 卷七)은 구마라집(鳩摩羅什)이 한역한 묘법연화경을 저본으로 1422년(세종 4)에 비구 덕명(比丘 德名)이 어머니의 극락왕생을 위해 발원하여 감지에 은니로 쓴 7첩 중 ‘권3’과 ‘권7’의 2첩에 해당된다. 표지에는 보상화문(寶相華紋) 네 송이가 장식되어 있으며, 화문(花紋)은 금니로, 화경(花莖)은 주로 은니로 그려져 있다. 권수(卷首)에는 금니로 변상도를 그리고 변상도 다음에 권두 서명과 구마라집의 역자(譯者) 표시가 보인다. 서체는 사경체(寫經體)의 특징인 조맹부체(趙孟頫體)로 썼다. 사경의 후면에는 묵서(墨書)와 주서(朱書)의 ‘광덕사(廣德寺)’ 사찰명이 쓰여져 있다. 이로 보아 이 사경은 천안의 광덕사에서 사성되었거나 혹은 복장되었을 것으로 추정된다. 후면에 ‘광덕사’라는 사찰명이 주서되어 있고 이 사경과 크기·체제·경문의 글씨가 동일한 사경으로 보물 제269호 “감지은니 묘법연화경 권1”과 보물 제390호 “광덕사 고려사경” 중 ‘감지은니 묘법연화경 권2·4·5·6’이 있다. 기존에 지정되어 있는 것에 동아대학교 소장본인 권3과 국립중앙박물관 소장본인 권7을 합하면 완벽한 “1질”을 이루게 되며, 이는 전래된 사경 가운데 전질이 밝혀진 것이 드문 예로써 더욱 큰 의미를 지닌다. This is part of a Buddhist sutra version made by Monk Deokmyeong in 1422 (4th year of King Sejong’s reign) based on the one translated into Chinese by Kumaraju to pray for the peace of the spirit of his deceased mother. The sutra is composed of seven volumes. The cover is adorned with four sets of Palmette patterns. The overall flower pattern is drawn in gold powder, whereas the stalks are done in silver powder. 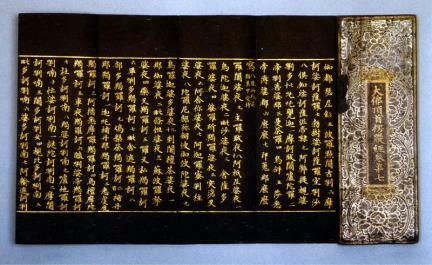 The sutra painting at the beginning of the book is drawn in gold powder. It is followed by the title of the book, and then the name of the translator, Kumaraju. The characters are written in Zhao Mengfu-style handwriting. Written on the backside of the sutra is the name Gwangdeoksa Temple in black and red. Vol. 3, which is kept at Dong-a University, Vol. 7, which is kept at the National Museum of Korea coupled with Vol. 1 with the same size, format, and handwriting (Treasure No. 269), and Vols. 2, 4, 5, and 6 (Treasure No. 390) comprise a complete 7-volume set. This is a rare case of an original Buddhist sutra whose complete set has been found.